Joy Creek Photo Archive (c) all rights reserved The early blooms of Clematis 'Royalty' (Treasures, 1985) are semi-double purple-mauve. Late blooms are smaller and single. 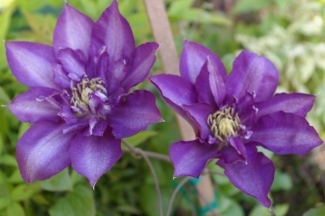 All of our Clematis are two year old plants that are suitable for immediate planting in your garden. Early summer; midsummer to late summer. 6-8 ft.